"I currently have two horses in my barn. I have a beautiful dark bay Holsteiner named Nouri and an award winning American Paint named Tonta. We enjoy our time trail riding and exploring. We purchased a property that had an existing structure which was in need of extensive repair. We contacted several companies and visited other facilities. We selected Lucas Equine Equipment and are very pleased with the attention to detail and the quality of construction. We selected the galvanized steel and paired it with tongue and groove Cypress. 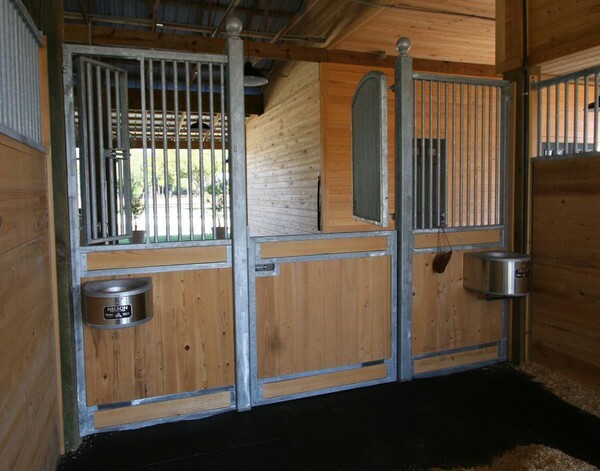 We selected Dutch doors for the front and back of each stall along with a feeding door. The sides of my stalls are 6 feet and then I added an additional grating on top which provides constant airflow. My horses have the ability to come and go as they please and I like the open feeling that the Dutch doors give me in each stall. We highly recommend Lucas equine Equipment. The company was very responsive, professional and provided a top-notch product. I LOVE my barn. Thank you Lucas Equine!" Renee spent a lot of time designing and planning her dream barn for her lovely babies and we are so happy that she chose Lucas Equine as their stall provider. We would like to thank Mr. & Mrs. Bailin for their business and the opportunity to work with such wonderful people. We hope you and your beautiful horses enjoy your new barn equipment for years to come!